Add water & tomato paste to make 4 cups & add to basmathi rice. Add turmeric powder, salt to rice & cook well. Heat oil in a pan, add cardamom,cloves, bayleaves,cumin seed, onion ,ginger garlic paste & saute few mins. Add mushroom & allow to sweat. Add chilli powder, garam masala & cook well. 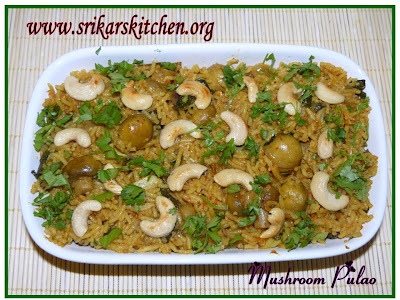 Mix rice & garnish with roasted cashew nuts & Cilantro. great idea to cook the rice with tomatoes! I love mushrooms! the pulao looks really good! காளான் புலாவ் சூப்பர் ப்ரியா.ப்ரெஷண்டேஷனும் அழகாயிருக்கு. very very tempting recipe and pic. too nice post. really tempting and nice decoration..
Thats such a tempting pic.Fab! OMG..pulav looks mouthwatering Sri..slurrp slurrp.. Wow!! looks so tempting...Sure gonna try it!!! Looks good and nicely garnished. Please pick up your award and tag from my blog! Cooking wih tomatoes! Sounds new and the pulao is very perfect. Yummy!